Grandparents, it’s been a while since you had babies and toddlers to deal with in a restaurant. Now you’re on a special holiday with the little ones and it’s a challenge to say the least. Here are several tips that will keep the fun in the vacation when it’s time to eat. Whenever possible, dine out of doors with young children. There is usually more freedom to move around and the noise levels will not be expected to be as low. Outdoor seating is enjoyable for both children and adults, and any messes made will not be as difficult to clean. 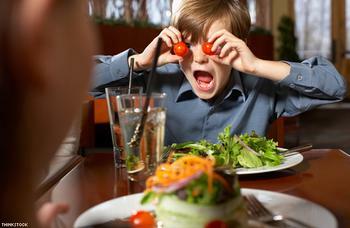 Children’s menus are often both short and unhealthy. Allow each child to have their own menu, even if they aren’t readers yet, and then select from appetisers, a la carte items, or light choices. Or opt to order a full meal and split it between children. Order something small for the children and then supplement from bring-along items you know they will enjoy. Most restaurants won’t mind if you do this. If you’re in a too-fancy for kids restaurant, you’ve made a poor choice. Time to move on. Sometimes when you’re travelling with babies or toddlers, there is no easy way to be in a public place for meals. If they’re fussy and crying, better to cut your losses, package up the orders and exit the restaurant. Other diners will thank you and your own stress levels will drop. It’s as Easy as 1-2-3! Best Deals in Town! August 26, 2010 Jan Comments Off on It’s as Easy as 1-2-3! Best Deals in Town!